Image caption The performance in mental health care times is the worst since the target was set four years ago. 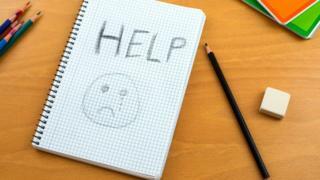 A third of children referred to mental health services in Scotland are not being seen within the 18-week target. The performance statistics are the poorest since the government said four years ago that 90% of children should be seen within that time. They also indicate an increase in the number of children accessing child and adolescent mental health services. Minister for mental health, Clare Haughey said the figures were "completely unacceptable". The latest statistics were released just weeks after a task force was announced to tackle the issue. Further measures were announced by first minister Nicola Sturgeon as part of the Scottish government's legislative programme. She said an extra £250m funding for mental health services would include £60m for school nursing and counselling services. An additional 80 counsellors will be funded to work across further and higher education, she said. The official figures reveal that only 67.8% of the 4,664 children and young people who started their treatment between April and June did so within the target time. That compares with 71.1% in the previous quarter and 80.7% for the same quarter in 2017. It is the worst performance since the target was set in 2014. The number of children accessing services is up from the previous quarter (3,995) and from the quarter ending June 2017 (4,092). Only three health boards met the government target to see 90% of children within 18 weeks - NHS Ayrshire and Arran, NHS Shetland and NHS Western Isles. In NHS Tayside, only 34.4% of people were seen within the target time, while Forth Valley and Grampian failed to achieve 50%. Lib Dem health spokesman Alex Cole-Hamilton said: "These statistics are horrendous and heartbreaking." Scottish Labour's health spokesman Anas Sarwar said: "To have nearly a third of young people waiting longer than 18-weeks for vital mental health treatment is a scandal - and, despite all the warm words from the SNP, this problem is actually getting worse." The Scottish Conservatives' mental health spokeswoman Annie Wells described the level of care as "shocking", and said "unacceptably long waits could be causing untold damage to extremely vulnerable people". Separate statistics show 76.3% of patients waiting for psychological therapies were seen within 18 weeks between April and June - down slightly from 78.4% in the previous quarter. Ms Haughey said mental health services would be addressed in the first minister's legislative programme for 2018/19, announced on Tuesday. A new taskforce set up in June is working to reshape and improve Child and Adolescent Mental Health Services (Camhs). Ms Haughey said: "Demand for services is increasing as people become more aware of mental health issues and seek support, and this is a welcome step. "But too many children and young people are experiencing waits that are too long, and this is completely unacceptable." She said the Scottish government was supporting health boards with £150m of extra funding over five years, including £54m to help improve their performance against waiting times targets. Earlier, Nicola Sturgeon told BBC Scotland: "One of the good things about modern society is that we all feel much more comfortable talking about mental health and mental wellbeing. "When I was at school nobody talked about that - the stigma's reducing. "But that means more people feel able to come forward for help. "We've got a duty to make sure that help is available where it's most appropriate. "And we need to make sure that there's more support in communities, including in schools, for good mental wellbeing."